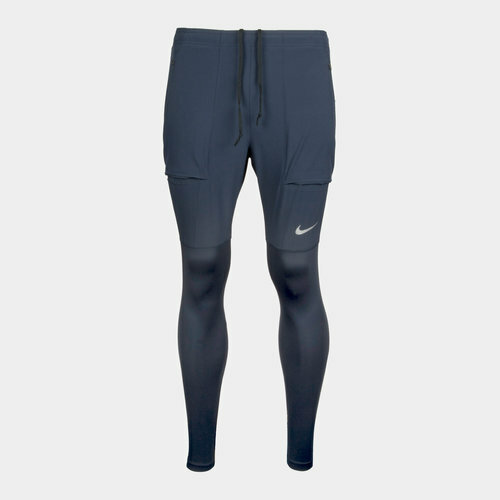 A casual look and feel but one with hidden warmth for those chilly days (and nights), Nike's Essential Running Pants comfortably raise the temperature. Made from polyester, the soft material incorporates Nike's performance Dri-FIT fabric which pulls sweat away for a dry and comfortable feel that gets you warm and then retains the heat. If you do feel the need to cool down and let out some heat then the zipped ankle cuffs aid this or also mean you can easily pull on/off the trousers without having to remove your footwear. There's no need to worry about your essentials either, such as keys, loose change or your phone, as zipped side pockets are included. Sporting a plain obsidian look with, the signature Swoosh features on the left thigh.